I forward this review by saying I bought it at work. On that note, this post will also serve as my unofficial announcement of affiliation with BONeJOUR Pet Supply. Even though I bought this product at a discount at BONeJOUR, I still purchased it with my own money and this review will reflect that unbiased fact. Dipper has bad teeth. It’s the curse of the small-breed dog. But what Yorkies lack in oral health, they make up for in cuteness, so I’ll take it. TropiClean has a massive line of oral health products for dogs and cats, from traditional tooth brushing kits and dental chews to water additives that freshen breath without manual brushing. You can buy their products far and wide—I’ve seen them on Amazon, at Walmart, and on the shelves of even the most high quality pet retailers. Like most dogs, Dipper’s not a fan of having his teeth brushed, and I wasn’t too keen on the idea of adding a mysterious liquid to his water. But in hindsight, I’m not sure why I thought squirting a mysterious gel into his mouth would help, either. The gel freshened his breath for about 30 minutes after application. It quickly became clear that the gel simply masked his bad breath, the least of my problems (as an aside, I’m weird: I really like the smell of dog breath). Thus begins my rant against pet dental products. With products like this, you really have to look at the fine print. Another reason I declined to buy the water additive was because it claimed to “freshen breath,” not necessarily to reduce plaque and tartar. This is problematic because the root of the bad breath problem is the presence of plaque and tartar. If you don’t get rid of this buildup, the bad breath won’t go away. All these products do, then, is cover up the stench. I gave this product a fair shake. I planned to review it after a month of use, but after we didn’t see any changes, I decided to wait another month. I applied it on Dipper’s teeth daily. Still nothing. That isn’t to say this product is wrong for every pet. Nor is this a reflection of all TropiClean products—Dipper thoroughly enjoyed the dental chews I bought him (whether they did anything to clean his teeth is up for debate). As for this gel, I think a dog with minimal plaque and tartar buildup could have luck using it for preventative purposes. But it does little to nothing for present dental disease on dogs like Dipper. For that reason, I’ll keep using it to prevent further buildup on his teeth…but I won’t buy it again. I guess it’s time to see the doggie dentist. 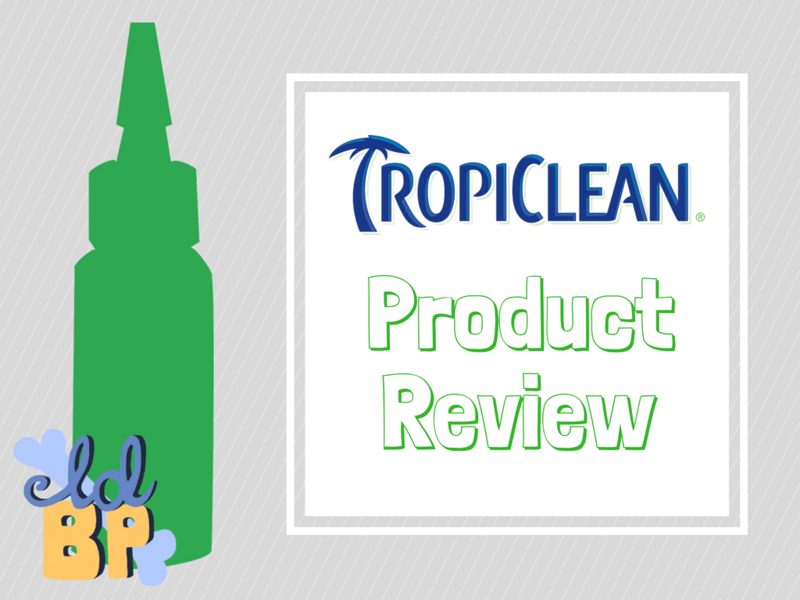 Have you had any luck with TropiClean products? Get a conversation going in the comments below! 2 of my dogs have bad teeth too.. I think these products are great to prevent damage, but if you really want to clean them, you’ll have to go to the vet! Thank you! I appreciate that. My own funds are limited, so I don’t want to pour money, time, or effort into something that isn’t ideal. I really strive for honesty here. To combat oral problems, the absolutely best way is to brush. I know it’s tough and I didn’t start brushing my dogs teeth until she was a year old. Get one of those finger tooth brushes and start really slow (like just touch his teeth with the brush). Eventually you’ll be able to brush his teeth and he will tolerate it (or even enjoy it!). Try different toothpastes if your dog really dislikes the ones you’ve tried, this can make a big difference. Another great method is raw bones. For small dogs, chicken backs or necks are ideal. Only use bones if you actually know you dog doesn’t just swallow everything. Of course bones do carry a risk which you need to keep in mind. Best of luck with Dipper! Dipper is definitely a bone swallower (that sounds kind of explicit out of context, ha!). A lot of the progress I’ve seen on his teeth since adopting him – trust me, his teeth were worse than pictured when I got him a year ago – have been the result of hard chews and bullysticks. I do try and get into his mouth at least once a week with a brush, but I figured this was worth a try for those off days. Alas. Thanks! Hey Tori! This is James from TropiClean. I read the review and I’m sorry that it didn’t break up the tartar on Dippers teeth! Sometimes to combat tartar and buildup, you may have to use a brush and brushing gel. We do offer numerous products and solutions that fit the needs of Dipper and yourself. Have you seen our Advanced Whitening Oral Care kits, or our Advanced Whitening Clean Teeth Gel? Maybe I’ll give those a shot. I’ve since started brushing his teeth on the regular, but I continue to use the gel for our days between brushes. Thanks! Absolutely agree with you about this product. My 12 year old Cairn has pretty bad plaque and tartar and I’ve been using the gel for 2 months. I’ve seen zero improvement and I feel like a fool for believing something as simple as applying a gel every day would solve the issue. The only thing that will get rid of plaque and tartar is undergoing a dental procedure at the vets, then you should brush your dogs teeth every day following that and could use the gel in conjunction with brushing to keep the nastys at bay. I think we’re all desperate to find that Holy Grail product that’s just going to fix our pets’ problems – especially when it’s something as important as dental health. So, I don’t fault you for trying with this gel, and you shouldn’t feel bad either! Good luck with your little one’s teeth!